Tags: HP, Photo Paper, K6B83A . Print, display, and relive life's moments. Decorate your space with your favorite social media photos. 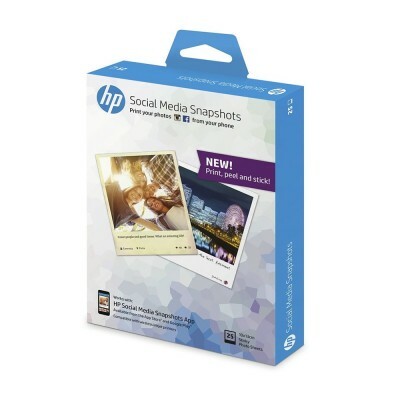 Print from your smartphone or tablet with HP’s app and stickable 4 x 5-inch paper for snapshots you can stick and remove easily. Easily print your Facebook, Instagram, or other photos—right from your smartphone or tablet. Print it, stick it, share it—and easily remove stickable photos when you're ready for something new. Add your own flavor. Write personalized captions—or pull existing ones—and choose from fun colored or basic photo layouts to tell your story. Connect with others—your way—with HP Social Media Snapshots. Print your social snapshots at home. Capture the activities you want to share, print, stick, and display, and later replace them with new snapshots—they're easy to remove. Media dimensions (single sheet, metric)	210 x 297 mm	Media sheets per package	100	Media finish	Gloss	Printing material brightnes..
Overview HP Advanced Photo Paper lets you print true-to-life photos with rich, vivid colours and an impressive finish. Photos dry instantly ..
OverviewHP Premium Plus Glossy Photo Paper is compatible with all inkjet printers and optimised for HP print systems to deliver an outstanding print e..
DescriptionsPrint instant photos with HP Sprocket PlusInstant prints, exclusively for HP Sprocket Plus. Not compatible with HP Sprocket or HP Sproc..